When Felicia Navarro thinks of Bishop-elect Nelson J. Perez, she feels a sense of irony. Navarro felt called by God to leave her hometown in the Diocese of Rockville Centre, on Long Island in New York, two years ago to become the director of religious education (DRE) at St. Cecilia Parish in Coatesville, Chester County. This year the parish merged with Our Lady of the Rosary also in Coatesville, and Navarro had to look for a new job. She found one as DRE at St. Agnes Parish in West Chester. The pastor there, Msgr. Nelson Perez, hired her for the coming school year. On June 8, Pope Benedict XVI named the 51-year-old Philadelphia priest an auxiliary bishop of Rockville Centre, where he will be ordained a bishop July 25 at 2 p.m. (the ordination will be streamed live at TelecareTV.org; see more video from Telecare). It will take place, perhaps coincidentally, at St. Agnes Cathedral in Rockville Centre. “God has a sense of humor in bringing me to Pennsylvania, and then sending the pastor who hired me to the diocese I grew up in,” she said. Bishop -elect Perez himself is used to hearing and responding to God’s call wherever and however it may come. Nelson Jesus Perez was born on June 16, 1961 in Miami, Fla., son of Cuban immigrants David and Emma Perez of Miami. He is the brother of Luis Perez and the late Dr. David Perez. The bishop-elect attended P.S. Number 4 Elementary School and Memorial High School, both in West New York, N.J., and graduated from Montclair State College in Montclair, N.J., in 1984 with a bachelor of arts degree in psychology with a minor in philosophy. From 1984 to 1985, he taught at Colegio la Piedad, a Catholic elementary school in Puerto Rico before entering St. Charles Borromeo Seminary. During the summers of 1985 and 1986, he worked as a staff therapist for Catholic Social Services in New York City. Bishop-elect Perez earned his master of divinity degree in 1988 and master of arts in theology in 1989 at the seminary. He was ordained May 20, 1989 and served as parochial vicar at St. Ambrose Parish in Philadelphia from 1989 to 1993. During that time, he also served as assistant director of the Office for Hispanic Catholics from 1990 to 1993. He is the founding director of the Catholic Institute for Evangelization, which provides pastoral formation and educational programs to Hispanic Catholics in the archdiocese. In 1998, he was named a Chaplain to Pope John Paul II with the title of monsignor. In 2002 he was named pastor of St. William Parish in Philadelphia, where he served until 2009. From 1994 to 2008 he served as an adjunct faculty member at LaSalle University in Philadelphia. In 2009 he was named a Prelate of Honor and appointed pastor of St. Agnes Parish in West Chester. 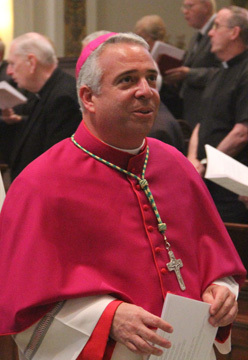 “Pope Benedict XVI’s appointment of Bishop-elect Perez continues a long and generous tradition of service to the Universal Church by priests from the Archdiocese of Philadelphia,” said Archbishop Charles J. Chaput, who will be a co-consecrator at the July 25 episcopal ordination with principal consecrator Bishop William F. Murphy of Rockville Centre. While he will be missed throughout the archdiocese, his departure will especially hit home with the parishioners of his most recent assignment – St. Agnes. Anna Vega, who is the former director of the archdiocesan Office for Hispanic Catholics, was delighted to hear of Bishop-elect Perez’s appointment, although she is sad that it is for another diocese. Elvira Suazo, also a Cuban immigrant who now is a member of St. Cecilia Parish in Philadelphia, has also known Bishop-elect Perez for a very long time. “I knew he would go high in the Church and was not surprised to hear of his elevation, because I know the kind of person he is, full of charisma and always there to support people in their times of need,” she said. Christian Brother Miguel Campos was born in Cuba and has served as a visiting professor at universities his order runs in the United States, Bolivia, Columbia, Venezuela, Costa Rica, Mexico, Spain and the Philippines. He is a long-time mentor of Bishop-elect Perez. “I hardly see myself as his mentor, and am flattered that he sees me as such, but I simply see myself as a friend,” Brother Campos said. Arcides De Jesus, who works at Casa del Carmen, a program of archdiocesan Catholic Social Services, knows Bishop-elect Perez from his time as pastor at St. William Parish. “He has the skill and intelligence to do great things in Rockville Centre, just as he did at St. William, and I know he will do much good there,” De Jesus said. The Diocese of Rockville Centre was founded in 1957 and is comprised of Nassau and Suffolk Counties on Long Island. It serves approximately 1.5 million Catholics in 134 parishes. The newly appointed bishops-elect will join current auxiliary bishops John C. Dunne and Paul H. Walsh in assisting Bishop Murphy. Bishop Perez – congratulations . Your kindness and gentle way is like no other. It was my honor and pleasure to serve with you in our Diocese of Rockville Center. Thank you for making our granddaughter Nicole Buono’s Confiramtion atSt. Mathew’s church such a wonderful experience for both my husband and me. Congratulations to Bishop elect Perez! !